To investigate sexual and anatomical outcome after Shears neovagina in patients with Mayer–von Rokitansky–Kuster–Hauser syndrome (MRKH). Forty-three consecutive patients with MRKH syndrome underwent surgery creating a neovagina according to Shears. Follow-up was 8 years. 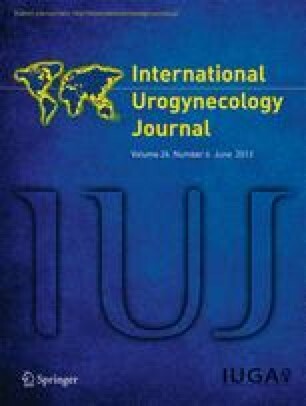 Sexual function was assessed using the Female Sexual Function Index (FSFI) as patient reported outcome; anatomical results were assessed measuring anterior, posterior and apical prolapse using the ICS Pelvic Organ Prolapse Score (ICS-POP Score). Pelvic floor contraction was measured applying the Oxford grading system. Thirty-seven of the patients were regularly sexually active and filled in the FSFI; mean total FSFI was 27.2 (range 24–28). No significant prolapse of the neovagina was noted, 11 patients had a grade I cystocele, rectocele or apical descent that was asymptomatic. Oxford grading of the pelvic floor contraction was 4 in median (range 2–5). The neovagina according to Shears is a valuable surgical option with good sexual and anatomical outcome 8 years after therapy. This study was not financially supported, but is investigator-driven.